Republican presidential candidate Ted Cruz has ended his campaign by gunning down the 565 delegates he has collected in the presidential primaries. “It’s a bloodbath for freedom and liberty,” Cruz yelled out while systematically slaughtering his delegates. After the massacre Ted Cruz and his supporters feasted on bacon that had been wrapped around the tip of Cruz’s machine gun. 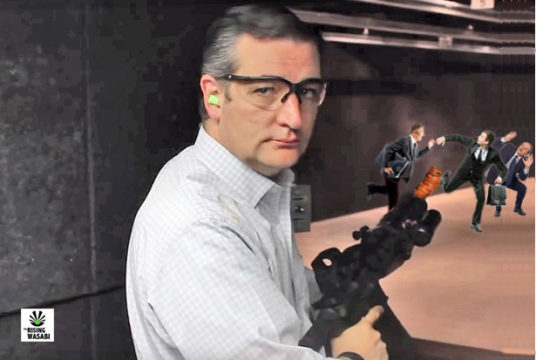 “We may not have the won the presidency but we’ll always have machine gun bacon,” Ted Cruz shouted to supporters. He’s just sending them back to Heaven like God told him to do. … That voice in his head is God, isn’t it?